﻿ The old Heather Nova Flash site is back online! The old Heather Nova Flash site is back online! There's some great news for those of you who liked the old nova flash site, because we decided to bring the site back to life. There's a reason for this: we started the Heather Nova Online Magazine in '01. In '03, I registered heathernova.us and this site was a fact! So this is our tenth anniversary and what is the best way to celebrate? To bring back some of that old magic we all know as multimedia! 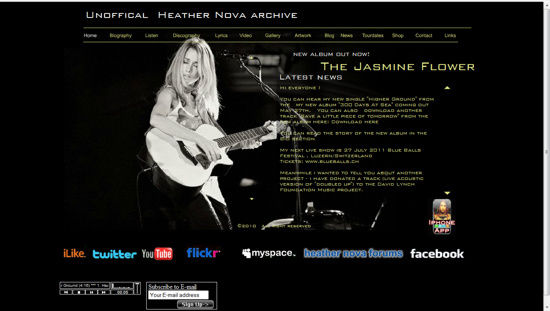 So we proudly present the old heathernova website that I created in '08.